Winchester, NH: After 3 weeks of no racing due to weather, Mother Nature final cooperated with a beautiful evening for a full card of NASCAR Whelen All-American Racing Series action plus Lightening Stocks, Young Guns, and the Valenti Modified Racing Series Fenton Family Dealership 100 presented by Mayhew Tools. Numerous drivers returned to victory lane including Sammy Silva (Young Guns), Gordon Farnum (Lightning Stocks), Matt Kimball (Mini Stocks) and Geoff Rollins (Sportsman Modifieds). James Nowakowski (Thunder Stocks) and Marc Curtis (Super Stocks) made their first trips to victory lane this season. Todd Patnode took his 2nd Valenti Modified Racing Series win at Monadnock this season. Young Guns took to the track for their 15 lap feature event. The 03VT of Elijah Castillo led the field to the green. Castillo led the first 5 laps of the race before getting lose entering turn 1 opening the door for Sammy Silva in the 28 to take the top spot. The caution came out on lap 6 as the 57 of Taylor Striebel lost the rear bumper cover off her car. Silva resumed command of the lead on the restart. Nathan Wenzel in the 03 wrestled away the 2nd spot from Striebel on the restart. Silva pulled away to a commanding lead to return to victory lane. Wenzel crossed the line 2nd and Striebel crossed the line 3rd. Lightning Stocks rolled onto the track next for 25 electrifying laps. The 95 of CJ Johnsons and the 16 of Chris Davis made up the front row. Johnson and Davis raced side by side for most of the first lap but it was Johnson who prevailed with the lead out of turn 4. As Johnson started to pull away with the lead a 4 car battle ensued behind him between Davis, 129 of Fred Rogers, Tim Leblanc in the 52 and the 46 of Gordon Farnum. On lap 4 Leblanc made a drive took the group 3 wide to take the 2nd spot. Then on lap 10 while Johnson, Leblanc, and Farnum were running nose to tail Leblanc made slight contact with Johnson getting him sideways but Johnson was able to save it and keep the lead. Farnum slipped by Leblanc to take the 2nd spot though. Farnum took the top spot on lap 12 and a lap later Leblanc took the 2nd spot. Matt Gauffin in the 68 worked his way thru the field and on lap 17 made the pass for the 3rd spot. The top 3 tightened up with 2 laps to go as they got caught behind lapped traffic. Farnum held on to take the win; while Leblanc finished 2nd and Gauffin finished 3rd. Farnum dedicated his win to 11- year old Caleb Hammond who is dying from Leukemia and who’s story made national headlines recently. Ina post-race inspection, Leblanc was penalized for a rules infraction giving Gauffin second and third went to Fred Rogers. Mini Stocks were next on the schedule for 25 laps of wheel to wheel action. Cory Plummer and Kevin Pittsinger brought the field to the green. Pittsinger took the lead at the drop of the green. Lap 2 saw a caution for the 83 of Tim Wenzel came to rest on the top of turn 2. Pittsinger had a new partner on the front row for the restart in Mike Radzuik in the 7. Pittsinger resumed the lead as Radzuik battled with the 93 of Tim Paquette for the 2nd spot with Paquette taking the spot until lap 4 when Matt Kimball drove his number 50x past him. Then on lap 6 Louis Maher took his 69z past Paquette for the 3rd spot. Kimball caught up to Pittsinger on lap 7 and made the pass for the lead. Maher followed Kimball past Pittsinger. Lap 13 Kevin McKnight in the 76 passed Pittsinger for the 3rd spot. Maher and McKnight tried to reel in Kimball but they ran out of time. Kimball returned to victory lane while Maher finished 2nd and McKnight finished 3rd. Kimball noted in victory lane he was just happy to get back to racing after so many weeks of bad weather. Thunder stocks roared onto the track for their 25 lap feature next. Dan Comeau in the 09 and the 88 of Hillary Renaud made up the front row. Comeau took the lead at the drop of the green as Renaud lost ground early. Chase Curtis in the 88x shot into 2nd followed closely by the 28 of Craig Chaffee. Chase Curtis took the lead on lap 5 and then on lap 8 Chaffee took over 2nd. The first caution came on lap 9 as the 26 of Chris Curtis and the 2 of Chris Buffone came to rest on the back stretch. Chase Curtis and Chaffee restarted on the front row but before things could get back going the 4 of Richard Vincent and the 21 of Doug McLean spun bringing the caution back out. Chase Curtis and Chaffee led the field to try it again; this time Chase Curtis and Chaffee battled side by side until Chaffee slowed on lap 11 with a flat tire. Chase Curtis would be joined by James Nowakowski in the 9 for the restart. Nowakowski worked the outside on the restart to take the lead on lap 12 and a lap later the caution flew for the 39 of Bruce Clark. Due to the high number of cautions the field would start single file but right after the green was waved the caution came back out for the 42 of Jeff Morse spinning. Nowakowski paced the field on the restart but the caution flag flew again as the Vincent came to rest in turn 3 with a flat tire. The third time would be a charm as the field would restart and go back to racing. Nowakowski started to pull away as Ben Williams in the 7 battled for 2nd with Chase Curtis. On lap 13 Williams took over 2nd. Then on lap 19 the final caution flew for Comeau getting a flat tire. Nowakowski resumed the lead and used everything he had to hold off Williams to capture his first win of the season. Williams settled for 2nd and Chase Curtis brought his car home in 3rd. Nowakowski was excited to take the win after what he described as a tough season to date. Nowakowski dedicated the win the fellow Thunder Stock competitor Michelle Leh’s grandfather. Sportsman Modifieds took to the track next for 35 laps of excitement. Geoff Rollins in the 02 and the 98 of Tyler Jarvenpaa started 1st and 2nd. Rollins rocketed out into the lead at the drop of the green but was slowed on lap 3 as the 43 of Alexander Pearl spun. Rollins and Jarvenpaa led the field on the restart with Rollins getting the upper hand. The caution flew lap 5 as fan favorite Eric LeClair in the 52 made hard contact with the backstretch wall due to contact with Matt Kimball requiring the flat bed to remove his car from the track. Rollins resumed his lead on the restart. Joel Monahan in the 03 battled Brian Chapin in the 44 for the 2nd spot. Lap 10 saw another caution, this time for Jarvenpaa spinning. Rollins took off again on the restart while Monahan and Chapin battled for 2nd with Monahan prevailing. On lap 16 Ben Byrne in the 6 took over the 3rd spot. Then on lap 19 Brian Robie in the 25 spun. Rollins would face his roughest challenge on the restart from Monahan but Rollins was able to hold onto the lead. Chapin made the move for 3rd on lap 24 and 2 laps later took over the 2nd spot. Then on lap 27 the caution flew again as Byrne’s front bumper became locked in the rear bumper of Monahan. This resulted in the 2nd red flag of the race as it took the track crew a few extra minutes and some special tools to get the 2 cars apart. On the ensuing restart Alyssa Rivera in the 5A spun bringing out the caution again. Rollins would have to contend with another restart and this time Chapin would try everything he could to get around Rollins for the lead but wouldn’t be able to. Rollins took the win while Chapin finished 2nd and the 8 of Keith Carzello finished 3rd. The Super Stocks would be the last NASCAR Whelen All-American Series division of the evening. Nancy Muni-Root in the 96 and Dennis Stange in the 44 brought the field to the green. Stange jumped out to the early race lead. Cole Littlewood in the 12 and Tyler Leary in the 11x gave chase early on. Then on lap 6 contact between Leary and the 33 of Solomon Brow cost Leary a few spots. Then on Lap 10 the 16 of Tom O’Sullivan spun on the front stretch bringing out the first caution of the race. Stange and Littlewood brought the field back to the green. Littlewood wasted no time as he wrestled the lead away from Stange using the outside groove. Marc Curtis in the 27 followed Littlewood around Stange to take the 2nd spot. Then on lap 16 Curtis drove to the inside of Littlewood to take the lead. Then on lap 22 with the laps winding down Brow made the pass for 3rd. Curtis collected his first Super Stock win, while Littlewood finished 2nd and Brow finished 3rd. Curtis noted that each time he has brought his car he has got better and better. He hopes to make a few more races but with the recent addition of a new baby isn’t exactly sure how many more races he will make this season. The Valenti Modified Racing Series took to the track to wrap up the evenings racing action with the Fenton Family Dealership 100 presented by Mayhew Tools. Richard Savary in the 99 and the 13 of former Sportsman Modified driver Cameron Sontag brought the field to the green. Savary took the early lead followed closely by the 25 of Chase Dowling. The caution flew on lap 9 as the 47 of Dylan Rock came to rest on the Pit Road access road. Savary and Dowling brought the field back to green. Savary resumed the lead. On lap 13 Woody PItkat in the 52 took over the 2nd spot until lap 20 when Sontag drove his way around Pitkat. Then on lap 21 Dowling got around Pitkat for the 3rd spot. The 17 of Donnie Lashua had been lurking just outside the top 3 all race and then on lap 39 he made the pass for the 3rd place and a short period later would take the 2nd spot. On lap 53 the caution would fly for the 03 of Joel Monahan and the 66 of Andy Shaw. Savary and Lashua brought the field back to green but the caution would fly again. Savary and Lashua would try it again and this time the race would stay green with Savary going back to the point. Lap 61 would see a caution for the 88 of Russ Hershey, 44 of TJ Bleau, and the 83 of Michael Willis Jr. Savary and Lashua brought the field to the green again but before a lap could be completed the caution was back out as Lashua came to rest on the front stretch wall after losing a tire. During all of this Kirk Alexander in the 43 had worked his way to the 3rd spot and would take over the 2nd spot with Lashua out of the race. Savary and Alexander made up the front row on the restart. Savary held onto the lead and was followed closely by Alexander. Lurking just behind Alexander was the 24 of Todd Patnode who took down the win the last time the series was at Monadnock. Alexander tried to find a way around Savary but on lap 70 Patnode powered around the outside of Alexander to take the 2nd spot and then on lap 72 Patnode made the pass for the lead. Sam Rameau in the 6ma passed Alexander for the 3rd spot on lap 78. The 27 of Derek Robbie spun on lap 81 bringing out the caution again. On the restart Patnode held onto the top spot as Rameau made the pass on Savary for the 2nd spot. Quietly having a great run was the 25NH of current Sportsman Modified driver Brian Robie made the pass for 3rd. The caution flew once again on lap 90 for 92 of Anthony Nocella and Savary spinning. Patnode took off in the lead again and Robie used the restart to take the 2nd spot from Rameau. The last caution of the event flew on lap 98 for Sontag, Bleau and Jacob Perry in the 76. Patnode held of Robie to take the win; Robie finished 2nd and Rameau finished 3rd. Robie was beyond excited to finish 2nd and noted the last restart made him a little nervous as he had used most of his tires up by that point. Patnode admitted that he started a little quicker pace than he had originally planned based on how other drivers where going early on but was excited to repeat the same result as his last time out at Monadnock. 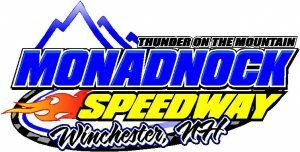 This Saturday, Monadnock Speedway will host the annual Open Track Party (that has been rescheduled twice before due to rain). Fans will be able to go trackside to meet the drivers and see their cars of Monadnock Speedway from 5:00 PM to 5:45 PM. Racing action will follow the track party and will include a 50 lap Sportsman Modified, Super Stocks, Mini Stocks, Thunder Stocks, Lightning Stocks and Young Guns. For more information, log onto the speedway’s website at www.monadnockspeedway.com.